Philipp Slusallek is full professor for Computer Graphics at Saarland University (since October 1999), Scientific Director at the German Research Center for Artificial Intelligence (DFKI) leading the research lab Agents and Simulated Reality (since January 2008), Director of Research at the Intel Visual Computing Institute of Saarland University (since May 2009). 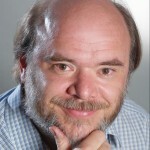 He is Principal Investigator at the Cluster of Excellence in Multimodal Computing and Interaction (M2CI) at Saarland University in close collaboration with the Max Planck Institute for Informatics the Max Planck Institute for Software Systems, and the German Research Center for Artificial Intelligence (DFKI). Besides, Founding Speaker of the Center of Excellence in Computer Science at Saarland University (since April 2004). Previous Positions: Dean of the Faculty for Mathematics and Computer Science at Saarland University (2002-2004), Visiting Assistant Professor at Stanford University’s Computer Graphics Lab (1998-1999), Head of the research group on physically-based rendering (the Vision project) at the University of Erlangen, Computer Graphics Group (1992-1998), Researcher at the Computer Graphics Group (GRIS) at University of Tübingen.